Posted by Lacey Hagler on Friday, October 26th, 2018 at 9:27am. Kingfish and large mutton snapper have been eating sardines near 120 – 200’, and yellowtail snapper has been showing up in strong numbers. Inshore, the mullet run is still hot, and snook, jacks, tarpon, ladyfish, and redfish aren’t far behind them. Live mullet or top water plugs at low-lighted times of the day near bridges, Juno Pier, Jupiter Jetty, or Palm Beach Inlet should bring you some bites during outgoing tides. The Juno Beach pier and the beach has has been pretty sold, with lots of bluefish, Spanish mackerel, jacks, runners, pompano, jacks, and redfish. Juno Bait recommends a Rapala X-Rap or Yo-Zuri Mag Darter for some solid action. Mangrove snapper have been feasting on live shrimp at the pier this week as well. Friday, 10/26: Mostly Sunny, High of 88 degrees, Southwest winds at 10-15 knots, 2-3’ seas at 7 second periods, Intracoastal waters a light chop. 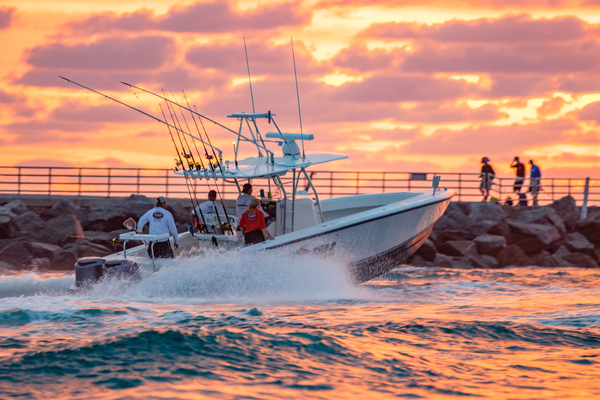 Saturday, 10/27: Mostly Sunny with a 10% chance of showers, High of 86 degrees, West winds at 5-10 knots, 2-3’ seas at 5 second periods, Intracoastal waters a light chop. Sunday, 10/28: Sunny, High of 79 degrees, North northeast winds at 10-15 knots, seas 2-4’, occasional 5’, Intracoastal waters a moderate chop. Don't have a boat? Check out our Fishing Charter Guide.